Bo at Ballard Creek by Kirkpatrick Hill. Henry Holt and Company, 2013. Currently available. Face Value: LeUyen Pham created phenomenal illustrations for the whole book, and the cover is the crown jewel. I love the way it captures both the unique setting and the cheerful tone of the story. 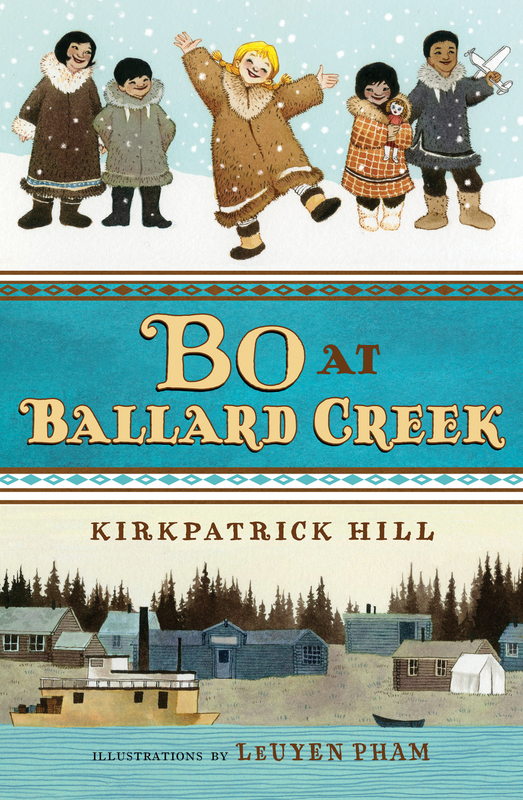 Every moment of Ballard Creek life is captured from a child’s point of view, and the cover appropriately highlights the children who live in the settlement. Does it break the slate? Bo is quite young to be a Slatebreaker, but she shows promising tendencies by always questioning why things are the way they are. I did appreciate the way Hill featured a family with two fathers and adopted children at the core of the story – this book challenges the notion of the traditional nuclear family in a gentle but firm way. Who would we give it to? Budding arm chair travellers will enjoy the way that the Alaskan setting plays a role in the story. This story would also appeal to young readers who got hooked on pioneer-style historical fiction and need to branch out a bit beyond the typical stories of covered wagons in the American West. Review: I had heard nice things about this book around the blogosphere, but it was a comment from blog reader Deb that spurred me to check it out from the library. I am so grateful to her for suggesting it! Bo at Ballard Creek was the most joyful reading experience I have had in months. Hill’s writing is the literary equivalent of comfort food. I adored the Laura Ingalls Wilder books as a child, and this book is written in exactly that style, but with Hill’s own special twist. Like the Little House books, Bo at Ballard Creek features beautiful descriptions of everyday life. Ballard Creek is a tiny mining town in Alaska. Bo lives there with her two papas, Jack and Arvid. The men are long time friends who decided to raise Bo instead of sending her to an orphanage when her mother gave her up. Although Bo’s family looks very different from most families, the town accepts them. Bo is one of the few young children around and is dearly beloved by the miners. It is hilarious and charming to read about these large, calloused men playing with Bo and her young friends. What makes this book so fascinating is the way that the setting plays into the story. The mining town brings together Eskimo families with immigrants and men with checkered pasts. Bo never judges any one of them for doing things differently than her family. She is curious and asks questions, eager to learn more about the different lifestyles of everybody in her close-knit town. I loved how Hill created an atmosphere of acceptance and warmth in this town. She paints a picture of community openness that seems radical even a near century later, as we struggle with acceptance in our twenty-first century communities. Everyone needs a warm and fuzzy book to cheer them up at some point. If you are frustrated with the relentless winter, or laid up with the flu, or maybe just need something to cheer you up, I highly recommend Bo at Ballard Creek. This entry was posted in Middle Grade, Reviews, Uncategorized and tagged Alaska, Historical Fiction, mining. Bookmark the permalink.